Successfully completing a certificate course from a reputed university is one of the easiest ways to get a promotion, increase your wages, or switch your job. Varying in length from a few months to years, with classes in the evening, nights, weekends and online, these courses will provide you with the advanced skills that are required to succeed in today's workplace. Many certificate courses require you to take exams (it helps in getting a job), some might require preparation from 3 to 6 months. Depending on your interest plan for a course/certification and related job market. Many certifications require you to clear/pass an exam. Some programs will require you to attend short term course and then clear an exam. You might have to visit labs for practicals etc. Some might require you to get classes for 6 months before appearing for the exam. Many jobs require to have some kind of work experience - it's possible that you may have to work as a trainee to get some experience before getting a right job. There are some quick certificate programs which may offer certificate in few days (just by attending classes/seminar). Those kind of certificate may not help much in getting a job, they might just improve your existing knowledge / skills. For 2019 - Healthcare industry has lot of short term programs, courses and certifications many of them don't require any degree. People interested in healthcare can get certified and start looking for a job. (Basic certification might give you a start at $15/hr (depends on type of certification)). Your salary many not increase dramatically unless you have a degree or you end up in management role. IT Certifications can offer high paying jobs (in around two years), if you are looking for a career in software industry then try to get a degree and get certified (highly recommended if you don't have a degree) for a long term career (For 2019 this industry has one of the highest paying jobs in areas of cloud engineer, cyber security analyst, programming, machine learning, AI etc). 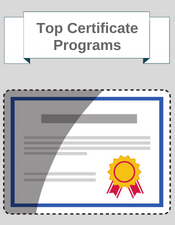 Below is a list of some short certificate programs which can lead to a good career. Cloud Engineer: If you have certification in AWS, Azure then you have a good chance in making a decent salary. There are plenty of job requirements in this area. Many junior to senior level jobs are available. IT Certifications: IT certifications like RHEL, MCSE, CCNA VMware, Java etc are always in demand (some experience always helps with certifications). With 2-3 years of experience you can easily make $100k+ salary. Always try to get certified even when you are working, it helps a lot in getting a new job and keeps you up to date with industry requirements.